An essential part of a healthy diet, Niacin (Vitamin B-3) can be hard to obtain from a regular diet, but as a a daily vitamin it can contribute to consistent health. Vitamin B-3 is involved in a range of metabolic processes and is a coenzyme in several important biochemical functions. 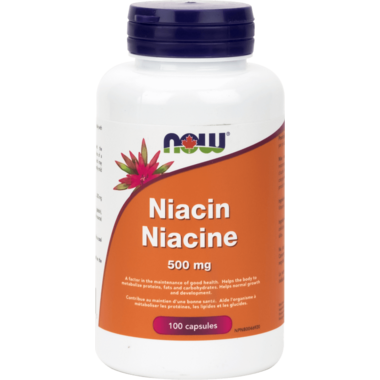 Niacin (Vitamin B3) plays an important role in many metabolisms including digestion, skin health, nerve function, and producing energy from food. High potency Niacin regimens have been researched to help lower LDL (bad) cholesterol and raise HDL (good) cholesterol. Non-Medicinal Ingredients: Capsule (gelatin), Cellulose, Magnesium stearate (vegetable source) and Silica. Directions: Adult Dose: Take 1 capsule daily with food.